현재 The Smiths의 재결합에 관한 최신의 확인되지 않은 소문은 가라앉고 있다. Johnny Marr가 – 전문가적인 타이밍으로 – 그의 솔로 데뷔 앨범 The Messenger를 발표하는 완벽한 타이밍으로 잡기로 결정했다. 1987년 The Smiths와 결별하면서 The The, Modest Mouse, The Cribs 와 함께 연주하면서( Electronic이나 Johnny Marr and the Healers와 같은 새로운 밴드들도 결성하면서) Marr는 그만의 새로운 것을 시작할 시기라고 생각했다. 2005년 미국으로 옮긴 이후, Marr는 베를린과 맨체스터에서 앨범을 녹음하기 위해 유럽을 여행했고, 이 여행으로 감정이 고양되어 앨범에 전체적으로 영향을 미치게 되었다. 이 앨범의 하이라이트 중 하나는 윤기있는 기타 러쉬, 에코가 실린 드럼, 바로 느낄 수 있는 캐치함, 그리고 층진 코러스가 특징인 The Right Thing Right다. 또한 아마도 Johnny Marr가 실제로 “우후”를 연발하는 모습이 유일하게 녹음된 순간일 것이다. 뭘 더 바래? • The Messenger는 워너뮤직을 통해 2월 25일 발매된다. 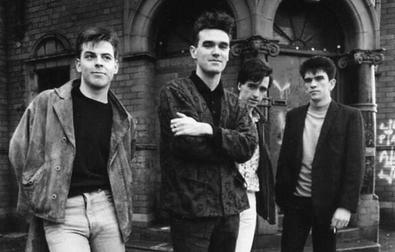 The Smiths had to break up because the pressure on me was intolerable. By the time of our third album, The Queen Is Dead, my drinking had spiralled out of control and it was making me seriously ill. Basically I was using alcohol to lessen the unbearable strain I was under. here are some Smiths fans who won’t even touch Morrissey’s solo stuff. Then there are the middle-grounders, those who will only admit to liking Your Arsenal, Vauxhall and I, and some of Viva Hate. Further along on the spectrum you have the younger generation, the teens and twenty-somethings who like Morrissey’s solo stuff just as much or more than his Smiths stuff (the most notorious group in this demographic being southwestern Hispanics). But the largest demographic is those who haven’t heard any of Morrissey’s solo stuff beyond “Everyday Is Like Sunday” and maybe “The More You Ignore Me, The Closer I Get.” So, I understand that a list of the most underrated Morrissey solo songs is scraping the barrel of obscurity. Nevertheless, in honor of His (yes, a capital “H” is in order) first studio album in seven years, I’ve compiled this woefully short (I had to widdle down my original twenty to the ten you find here) list of the Mozzers most underlooked and underrated solo songs. For those who haven’t even heard any of Morrissey’s solo stuff, forget this list and go buy the “November Spawned A Monster” single. Most artists only wish they could write just one lyric like “I’ve changed my plea to guilty / Because freedom is wasted on me / Outside there is a pain / Emotional air raids exhausted my heart / And it’s safer to be inside.” One of Morrissey’s best piano ballads, it also contains one of his most melodramatic, theatrical vocal takes. One of Morrissey’s most introspective songs, it’s underevaluation is most likely due to it being curiously sandwiched between the jocular ‘You’re the One for Me, Fatty” and the gospel-glam of “I Know It’s Gonna Happen Someday.” A simple acoustic melody backs Morrissey’s stark autobiographical lyrics that cover his entire, and lengthy, list of insecurities. If I was asked to point to one song that summed up What Is Morrissey?, I would aim the questioner here. For those saying Morrissey has gone all punk-pop with You are the Quarry haven’t heard this slab of power-popness. A sly title and concept laden with sexual undertones, the listener isn’t quite sure what this “one” is until the final lines: “Let the right one slip in / And when at last it does / I’d say you were within your rights to bite / The right one and say / “What kept you so long?” The image of Morrissey biting the tongue of a lover he’s waited so long for is so typically brilliant of him. Both written in ‘95 during Morrissey’s boxer and fake-cuts-on-his-face phase, both deal with fallen heroes and shattered dreams. The former is a sweet ode to Sonny Liston with less than subtle references to his alleged drug use: “With your jean belt wrapped around your arm / Oh, Sunny my heart goes out to you / And with the needle pressed on to tight skin / Sunny, I cry when I see where it’s taken you.” The song is accompanied by one of Morrissey’s best videos, where a trio of lower-middle class British youth loiter and love in Victoria Park. The latter shares the same theme of a fallen hero, but has a slightly more optimistic tone, with the losing boxer still being loved by his hometown and his nephew “all the same.” Released only as a single, Morrissey soon realized that it deserved more, and thus stuck the song on every compilation of his since. This song should be on every infatuation mixtape. Morrissey’s careful vocal phrasing makes his lyrics of unadulterated monogamy that much more forceful. The song is just so perfectly understated, so wonderfully airy, and so sweetly candid. When some unlisted female(?) singers wordlessly come in at the end, I’m already mush. Reputably the chorus of “he drew a swallow on my neck and more I will not say…” refers not to an actual bird tattoo (which has Nazi/SS soldier overtones) but, argues many, to a hickey. Most likely written about the onset of a relationship between Morrissey and his former “personal assistant” Jake Walters around ‘94, the song is undoubtedly a love song, and one of Morrissey’s best. Buried as the second B-side on the “Sunny” single, the song was later given another shot on the underrated My Early Burglary Years compilation in ‘98. Rightfully called “the all-time greatest hit that Morrissey forgot to record,” “Jack the Ripper” was, in its first incarnation, a slightly instrumentally subdued, morbid love plea from the perspective of the Victorian killer. Reincarnated with guitar-slicing gusto on the import only live album, Beethoven Was Deaf, the live version surprisingly gained considerable coverage on alt. rock radio stations in ‘93. In true Morrissey fashion, the final repeated lines of “Nobody knows me” insists that Morrissey feels some sympathy and possibly a sort of kinship with the murderer. A haunting track, the live version has since appeared on both the “Now My Heart is Full” single and the “My Early Burglary Years.” Possibly in an attempt to further highlight this missed rock of gold, Morrissey extensively played the song on his 2002 tour. Here’s hoping he throws it in on his current tour. 9월 초 VH1은 ‘Top Eighty Of The 80s’이란 이름 아래 80년대 대표적인 80곡을 선정하여 발표했다. 그들의 선정 기준은 80년대 혁신적이고 중대했던, 그리고 많은 논의가 이뤄졌던 곡들을 중심적으로 다룬 것. 당연 우리가 생각하고 있는 바로 그 음악들이 여기 80곡에 포함돼 있다. 마이클 잭슨(Michael Jackson), 마돈나(Madonna)로 대표되는 MTV 시대의 리더들을 비롯해, 80년대 메탈 씬의 굵직한 흐름을 이뤘던 데프 레퍼드(Def Leppard), 포이즌(Poison), 본 조비(Bon Jovi), 스키드 로우(Skid Row)와 같은 LA 메탈 밴드들, 그리고 뉴 웨이브 후기에 등장한 컬쳐 클럽(The Culture Club), 듀란 듀란(Duran Duran), 아하(A-Ha)와 같은 로맨티시즘 밴드들이 그들이다. 그 나머지 80곡을 이루는 이들 역시 고개를 끄덕끄덕할 만한 이름들이다. 그리고 프로그레시브 일렉트로닉 밴드 아트 오브 노이즈(Art Of Noise)나 실험적인 펑크 밴드 큐어(The Cure)와 같은 영국 밴드와 미국 언더그라운드 펑크 밴드 데보(Devo), 그리고 1980년 [Boy]를 통해 등장한 U2의 이름은 그 주요 흐름의 바깥에서 만날 수 있는 특별히 반가운 이름들이다. 그러나 80년대 모든 음악이 MTV와 댄스 팝, 로맨틱 뉴 웨이브, 팝 메탈로 채워졌던 것은 아니다. 가장 대중적인 음악이 성공한 음악이었던 80년대에도 실험적인 음악은 존재했다. 이미 얼터너티브의 원천이 80년대 초부터 형성 되기 시작했으며, 언더그라운드, 인디 씬에서는 메인스트림과는 별도의 특징적인 사운드가 마련되고 있었다. VH1의 선정 리스트에는 R.E.M.의 이름은 빠져 있다. R.E.M.의 대중적인 성공은 90년대 이르러 두드러졌지만 현재 시점에서 80년대를 되돌아 볼 때 그들은 이미 중요한 밴드였다. 즉, VH1의 ‘Top 80’ 선정 기준은 현재로부터 과거를 되돌아 보는 관점이 아니라, 당시 가장 대중적이고 성공적이었던 곡들에 중점을 둔 것이다. 그렇기에 80년대 영국 음악의 주요 흐름을 이뤘던 슈게이징이나 80년대 중후반 미국 언더그라운드에서 움트기 시작한 노이즈/드림 팝 등도 이 리스트에서는 빠질 수밖에 없다. 그러나 어느 시대나 인디, 언더그라운드 씬은 결코 무시할 수 없는 부분이다. 그 적합한 예로 들 수 있는 것은 이제 누구나 알고 있는 너바나(Nirvana)일 것이다. 인디 레이블 서브 팝(Sub Pop) 출신의 너바나는 90년대 초 록 씬은 물론 문화 전반에 걸쳐 메인스트림을 주도했다. 언제나 새로운 가능성을 향해 열려 있는 인디, 언더그라운드(적인) 음악을 듣는 일은 메인스트림에서 듣지 못했던 남다른 사운드를 만날 수 있는 계기가 된다. 그러나 이 열 장의 앨범이 80년대 그러한 음악을 온전히 대표하는 것은 아니다. 다만 일례가 될 뿐이다. 많은 아티스트의 이름과 그들의 앨범이 여기서 또 누락되기는 마찬가지다. 뉴 오더(New Order)나 R.E.M 등 역시 꼭 거론해야겠지만 되도록 국내에 소개가 덜 된 아티스트를 중심으로 (너무도 단촐한) 10장을 선정했다. 염두에 두어야 할 것은 이것은, ‘Top 10’이 아니라 ‘열 개의 추천작’일 뿐이라는 점이다. 80년대 언더그라운드의 가장 독특한 밴드 중 하나인 콕토 트윈스(Cocteau Twins)의 세 번째 정규 앨범. 로빈 거스리(Robin Guthrie)의 부드럽게 흐느적거리는 기타, 사이몬 레이몬드(Simon Raymonde)의 낮은 베이스 연주, 그리고 여성 보컬리스트 엘리자베스 프레이저(Elizabeth Fraser)의 아련한 보컬이 어우러져, 어두운 듯하면서도 신비로운 사운드를 연출해 낸다. 낮은 베이스 연주와 달리 엘리자베스의 보컬은 대기를 부유하는 듯하다. 관능적인 듯하면서 짙은 허무의 인상을 드리우고 있는 그녀의 보컬은 여러 번의 보컬 더빙을 통해 더욱 아름답게 느껴지며, 때로는 모호하게 느껴지기도 한다. 다양한 이미지를 내포하고 있는 보컬리스트 중 하나. 이러한 인상은 앰비언트적인 요소가 덧입혀지면서 더욱 짙어진다. 콕토 트윈스는 마이 블루디 발렌타인(My Bloody Valentine)를 비롯한 드림 팝 밴드들처럼 노이즈를 적극적으로 사용하지는 않는다. 그러나 가장 최면적인 사운드를 들려주는 이들은 일련의 드림 팝 밴드들 중에서도 가장 독보적인 위치를 차지하고 있다. 초창기 콕토 트윈스는 다소 거칠고 다듬어지지 않은 듯한 사운드를 들려줬지만 이 앨범을 거치면서 그들은 한결 멜로디컬하고 부드러워진 사운드를 들려준다. 이 앨범은 콕토 트윈스가 그들의 독특한 사운드의 완성 단계에 접어든 시점에 놓인 앨범. 몽환적이고 모호한 사운드, 그리고 매혹적인 보컬에도 불구하고 이 앨범이 그들 초창기의 황폐한 느낌을 완전히 저버린 것은 아니다. 초기처럼 청자들을 시험에 빠져들게 하는 혼잡한 사운드는 아니지만 앨범 저변을 이루는 또 하나의 줄기는 황폐함이다. 그 때문일까. 콕토 트윈스의 사운드는 각 앨범마다 큰 변화를 거치지 않고 일관된 흐름을 지니고 있다. 80년대 영국 인디 팝을 말할 때 빠질 수 없는 이름, 그래서 이제는 국내 팬들에게도 잘 알려져 있는 밴드, 스미스(The Smiths). 특히 이들은 당시 대학가를 중심으로 가장 신망을 얻었던 밴드 중 하나다. 국내 팬들에게는 보컬리스트 모리시(Morrissey)가 더욱 잘 알려진 이름이지만 기타리스트 쟈니 마(Johnny Marr) 역시 빼놓을 수 없다. 모리시가 특유의 유머 감각으로 스미스의 가사를 전담했다면 쟈니 마는 명석한 작곡력으로 그것을 완성 지었다. 그러나 이들 화려한 콤비도 오래 가지 못했고 1987년 쟈니 마가 스미스를 떠나면서 밴드는 해체됐다. 이 앨범은 팀이 와해되기 전에 발표한 앨범으로 가장 스미스 사운드에 충실한 앨범. 해체까지 얼마 안 남은 상황이었지만 이 앨범에서 스미스는 비약적인 사운드를 보여주는데, 그들의 어떤 앨범보다도 가장 록킹한 사운드를 담고 있다. 뉴욕 아방가르드 씬의 대표적인 밴드 소닉 유스(Sonic Youth). 이 앨범은 많은 사람들이 소닉 유스의 대표작으로 여기는 작품이다. 6, 7분대의 곡들이 곳곳에 포진하고 있는, 70분이 넘는 대작에 가까운 앨범. 전위 예술을 방불케 하는 난해한 사운드를 특징으로 삼고 있는 소닉 유스의 실험적인 태도는 이 앨범에서도 변함없지만 단촐한 앨범 커버처럼 그 어느 때보다 귀에 잘 들어오는 연주를 들려준다. 전작들에 비하며 상당 부분 난해한 사운드가 정제돼 있는 느낌. 물론 ‘Silver’와 같은 펑크 지향적인 사운드나 3부작 ‘Trilogy’와 같은 곡은 여전히 소닉 유스의 기본은 실험성에 자리 잡고 있음을 보여준다. 70년대 중반 결성돼 영국 인디 씬을 변함 없이 지켜온 밴드 중 하나. 비치 보이스(Beach Boys)와 비틀스(The Beatles) 풍의 60년대 팝/록으로부터 영향 받은 XTC는 70년대 말 뉴 웨이브의 영향까지 받은 사운드를 동시에 지니고 있다. 신디사이저의 쓰임새나 비치 에브뉴 보이스(Beech Avenue Boys) 보컬 역시 뉴 웨이브적인 감수성을 품고 있다. 진지하고 실험적인 사운드를 애호하는 이들에게 이들의 음악은 다소 유치증에 걸린 것처럼 느껴질 수 있다. 그러나 60년대 팝적인 감각과 기타 사운드를 적절히 섞은 사운드만큼은 언제 들어도 경쾌하다. 거기에 혼과 스트링이 더하여진 사운드의 묘미도 쏠쏠하다. 소닉 유스와 함께, 커트 코베인(Kurt Cobain)이 흠모했던 밴드 중 하나로 알려지면서 뒤늦게 국내에도 알려진 미트 퍼펫츠(Meat Puppets)의 두 번째 앨범. 매번 커트 커크우드(Curt Kirkwood)의 아트웍으로 채워지는 앨범 자켓으로도 흥미를 갖게 되는 밴드다. 이 앨범에는 너바나(Nirvana)가 커버하기도 했던 ‘Plateau’가 수록됐다. 너바나처럼 3인조 밴드인 것도 흥미로운 부분이다. 그렇지 않더라도 이들의 사운드와 너바나 사이에서 충분한 공통점을 발견하기는 어렵지 않다. 기타와 보컬을 맡고 있는 커트 커트우드의 보컬마저도 흡사 [Unplugged] 앨범에서의 커트 코베인과 닮은 듯하다. 이 곡을 들어보면 커트 코베인이 가능한 원곡의 느낌을 헤치지 않으려 했던 것을 알 수 있다. 쉽게 무엇이다, 정의 내릴 수 없는 독특한 사운드를 담은 이 앨범은 밴드 지향적이기보다는 싱어 송라이터의 앨범에 가깝다. 얼터너티브, 그런지의 노이지 기타는 이 앨범에서도 이미 드러나고 있지만 결코 과도함은 없다. 마치 닉 케이브(Nick Cave)의 온화해진 우울하고 느린 펑크를 듣는 듯하다. 벨 앤 세바스찬(Belle & Sebastian)을 통해 이제는 결코 낯설지 않은, 영국 대중음악의 또 다른 중심지 글래스고우 출신의 지저스 앤 메리 체인(The Jesus & Mary Chain), 그들의 데뷔작이자 곧 마스터피스. 지저스 앤 메리 체인은 마이 블러디 발렌타인(My Bloody Valentine)과 함께 80년대 영국 슈게이징 팝을 이끌었던 글래스고우 출신의 밴드. ‘Just Like Honey’, ‘The Hardest Walk’, ‘You Trip Me Up’와 같은 곡들은 지저스 앤 메리 체인의 사운드를 명확하게 보여주는 곡들이자 슈게이징 사운드의 전형을 보여주는 곡들이다. 마이 블러디 발렌타인의 음울한 사운드와 달리, 다소 멜랑콜리하지만 팝의 감각에 충실한 멜로디 라인은 듣는 사람의 귀를 부담 없게 한다. 사실 욜 라 텡고(Yo La Tengo)는 80년대 중반에 결성된 90년대의 밴드라 하는 것이 더 옳을 듯하다. 더군다나 이들은 여전히 미국 인디 씬에서 왕성한 활동을 하고 있는 밴드 중 하나이기 때문이다. 인디 씬의 많은 기타 팝 밴드에게서 들을 수 있는 쟁글쟁글거리는 기타 리프는 이 앨범에서도 변함 없다. 이제 미국 인디 씬의 거장이 되어버린 그들이지만 이 데뷔작을 발표할 당시만 하더라도 별반 다를 것은 없이, 소박하고 단순하고 귀여운 사운드를 들려준다. [I Can Hear the Heart Beating As One]과 같은 보다 진중해진 후기 드림 팝 사운드를 기대했다면 이 앨범은 쟁글 팝 사운드에 더욱 가깝다. 슈게이징(Shoegazing)을 논할 때 가장 먼저 등장하는 마이 블러디 발렌타인(My Bloody Valentine)의 두 번째 앨범. 단 세 장의 정규 앨범에서 이들의 대표작을 논할 때 가장 많은 표를 받는 것은 마지막 앨범인 [Loveless]다. 소음과도 같은 기타 노이즈를 빼면 이들 사운드의 절반이 날아가 버릴 정도로 마이 블러디 발렌타인의 주요 토대는 기타 노이즈다. 그러나 이들의 기타 노이즈는 노이지함 그 자체에 중점을 두는 것이 아닌, 공간적인 개념으로 다가온다. 즉, 이들 음악의 바탕을 이루거나 혹은 뒷배경이 되는 토양인 것. 가끔은 지나치게 귀에 거슬리는 듯한 기타 노이즈에 예민해질 수 있으나 몽환적인 선율에 귀를 기울인다면 충분히 공감할 수 있는 앨범이다. 미국 인디 팝 씬의 주요 아티스트로 떠오른 데이몬 앤 나오미(Damon & Naomi)의 전신이었던 갤럭시 500(Galaxie 500)의 두 번째 앨범. 현재 데이몬 앤 나오미는 슬로우코어 위주의 멜랑콜리한 사운드를 들려주고 있다. 그것은 모하비 3(Mojave 3)를 연상 시킬 정도로 부드럽고 상냥하지만, 갤럭시 500 시절 이들의 사운드는 그보다 더욱 강렬한 인상을 남겼으며 또한 더욱 실험적이었다. 데이몬 앤 나오미가 따스한 인간미를 느낄 수 있는 어쿠스틱 포크에 가까운, 가사 전달 위주의 싱어 송라이터와 같은 모습을 보여주는 것과 달리, 갤럭시 500은 사운드적인 측면에서도 많은 노력을 기울이고 있다. 데이몬 앤 나오미의 사운드의 연장선 상에 놓인 앨범이라 여긴다면 그것은 완전히 오해다. 포스트 펑크 씬의 큐어(The Cure)와 조이 디비전(Joy Division)으로부터 파생된 고스 록(goth rock)의 영향권 아래 놓여있는 바우하우스(Bauhaus)의 두 번째 앨범. 장대한 바로크 풍의 편곡과 우울한 신디사이저, 프로그레시브한 기타 연주 등, 언뜻 서로 어울릴 것 같지 않은 요소들이 함께 하는 이들의 음악은 결코 쉽게 다가설 수 없는 성질의 것이다. 그것은 70년대 프로그레시브의 왕국이었고 이후 큐어와 조이 디비전과 같은 밴드들이 영국에 존재했기에 가능한 것으로 보인다. 오프닝 트랙 ‘Hair Of The Dog’부터 듣는 이를 주춤거리게 하지만, 훵키/사이키델릭한 기타 리프, 스토리텔링하는 듯한 보컬을 지닌 ‘Passion Of Lovers’와 ‘Of Lillies And Remains’ 그리고 초창기 펑크의 잔향이 남아있는 ‘Dancing’ 등은 아주 낯설지 만은 않다. 고딕적인 그로테스크한 분위기는 이들에게 쉽게 접근할 수 없는 장애물로 놓여있지만, 이 앨범은 80년대 영국 음악의 또 다른 면을 들여 볼 수 있는 좋은 기회를 제공한다.